Background: Proper knowledge about risk factors and prevention of congenital malformations in pregnant women can lead to primary prevention of disease. The aim of this study was to explore pregnant women's knowledge about congenital anomalies, risk factors, and prevention in relation to their sociodemographic profile. Materials and Methods: A cross-sectional study of the expecting mother's population was conducted over 3 months. Data collection was done through a questionnaire completed in face to face interviews using simple nonrandom sampling method in 150 pregnant women who visited the prenatal clinics in Rasht. The questionnaire contained 6 questions about specific knowledge and 12 questions for risk factors and prevention of congenital anomalies. Statistical analysis was performed using descriptive statistics, Pearson correlation, as well as multivariate regression analysis was performed using SPSS 21 software. Results: The overall knowledge of pregnant women about congenital anomalies showed a significant relationship with age (P = 0.001) and the level of education (P = 0.000). However, there was not a significant relationship between overall knowledge and parity (P = 0.183) and the number of antenatal visits (P = 0.097). The participant who had High School and University education had the highest score in overall knowledge about the disorder. The age group 41-50 years had the lowest overall knowledge about the disorder. Conclusions: There is a need for public programs to increase awareness about congenital anomalies in pregnant women and people. Use of genetic counseling for families at risk for congenital anomalies is proposed. Congenital anomalies are also known as birth defects, congenital disorders or congenital malformations may result in long-term disability, which may have significant impacts on individuals, families, health-care systems of congenital anomalies varies between different countries ranging from 2% to 10% of births. ,, The causes of around 40-50% of birth defects are unknown. A combination of hereditary and environmental factors, genetics, maternal illnesses are attributed to congenital anomalies. , One way of achieving the fourth goal of the Millennium Development Goals goal is the reduction of congenital anomalies. Proper knowledge about disorders can lead to early diagnosis, prompt advice is effective to at least secondary prevention of disorders, and is very affordable. Until now extensive studies on the knowledge of congenital anomalies among pregnant women have not been conducted in Iran. The present study was conducted under the following aims and objectives. The aim of this study was to explore pregnant women's knowledge about congenital anomalies, risk factors and prevention in relation to their sociodemographic profile. To determine congenital anomalies relationship with sociodemographic characteristics. A cross-sectional questionnaire-based study with 150 pregnant women was conducted over 3 months in North of Iran. The research was approved by the Research Committee of Institution. Consent was obtained verbally after explaining the purpose of the study assuring confidentiality and the anonymity of the participating women. The third part included 12 questions about the participants' knowledge of the risk factors and prevention of congenital malformation. Finally, an open-ended question was designed about the participants' perceptions of the causes of congenital malformations. Total of 18 questions were closed-ended requiring such answers as "yes," "no," "i don't know." Maximum total score was 18 (6 points for specific knowledge plus 12 points for knowledge of the risk factors and prevention). Correct answers scored one point and a zero score was given for each wrong answer. Scores in the knowledge domain were categorized into three levels: Low (0-6), moderate (7-12), and high (13-18) levels. Statistical analysis was performed using descriptive statistics, Pearson correlation, as well as multivariate regression analysis was performed using SPSS 21 software (Gerdoo SPSS Collection). The level of significance was set at P < 0.05. Data were collected through face to face interviews and questionnaires were completed during clinical hours by the interviewer. A total of 150 questionnaires were obtained from pregnant women. [Table 1] reveals that the majority 101 (67.3%) of the subjects were between 21 and 30 years old. Only 4 (2.7%) of the participants were from 41 to 50 years old. The level of education of approximately 67 (44.7%) was high school, while 8 (5.3%) had only primary education. Their number of pregnancies ranged from 1 to 5 with 62 (41.3%) being pregnant for the 1 st time. Maximum number of antenatal visits 64 (42.7%) were 10-19. Participants' specific knowledge about congenital anomalies is shown in [Table 2]. Approximately 78 (52%) of the participants indicated that congenital anomalies are not a disease acquired by pregnant women while 122 (81.3%) believed that congenital anomalies could be managed medically. In addition, 113 (75.3%) were aware that congenital anomalies are preventable. 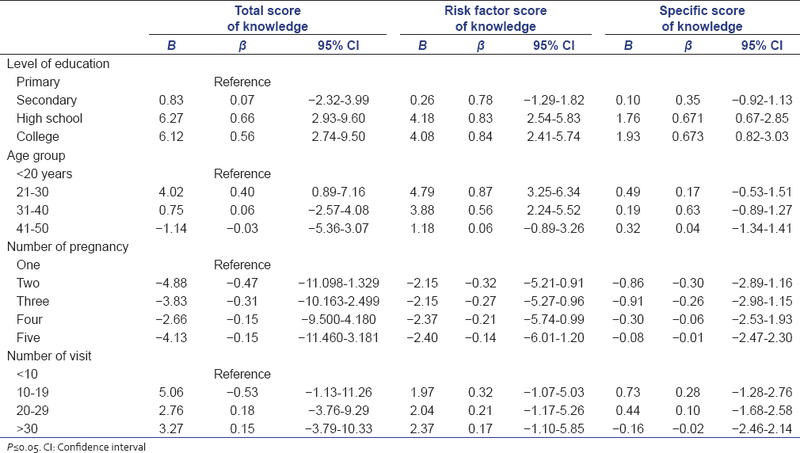 Participants' knowledge of risk factors and prevention of congenital anomalies are presented in [Table 3]. Almost all participants 148 (98.7%) believed that alcohol consumption during pregnancy is a risk factor for congenital anomalies. Furthermore, the majority of participants 143 (95.3%) believed that smoking during pregnancy is a risk factor in congenital anomalies. Only 35 (23.3%) participants identified maternal obesity as a risk factor of congenital anomalies while 140 (93.3%) were aware that X-ray during pregnancy is a risk factor. Most of the participants 123 (82%) reported consanguinity as a risk factor for congenital anomalies. 142 (94.6%) identified advanced maternal age (≥40 years) as a risk factor, 58 (38.7%) participants were unaware of the effects of the maternal infection. Some participants 57 (38%) were unaware of the impact of iodized salt on congenital anomalies. Majority of participants 140 (93.3%) believed that regular care during pregnancy lowers disorders. 115 (76.6%) participants were identified as believing that preconception counseling can be effective in reducing the congenital anomalies. Descriptive scores of participants on their level of knowledge of congenital anomalies are presented in [Table 4]. Half of the participants, 75 (50%) had low scores on specific knowledge. Many 80 (53.3%) of the participants had high scores on their knowledge of risk factors and prevention of congenital anomalies. Finally, 71 (47.3%) participants had moderate scores on the overall knowledge of congenital anomalies. Approximately 34 (23.66%) of the participants believed that "immoral lifestyle" is the cause of congenital anomalies. Relationship between categorical knowledge of participants about congenital anomalies and their sociodemographics characteristics are shown in [Table 5]. Most of the participants this study 101 (67.3%) were in the most childbearing age range of 21-30 years. Although 39% of Iranian women attend prenatal care clinics over 4 times. during their pregnancy months, the current study results showed that 42.7% cases of prenatal visits is between 10 and 19 times. This implies that pregnant women of this particular region in Iran pay more attention to prenatal care. Regular and frequent visits of pregnant women during pregnancy play an important role in increasing awareness of congenital anomalies. The result of our study showed that there were significant relationships between overall knowledge of participants with their ages (P = 0.001) and educational level (P = 0.000). 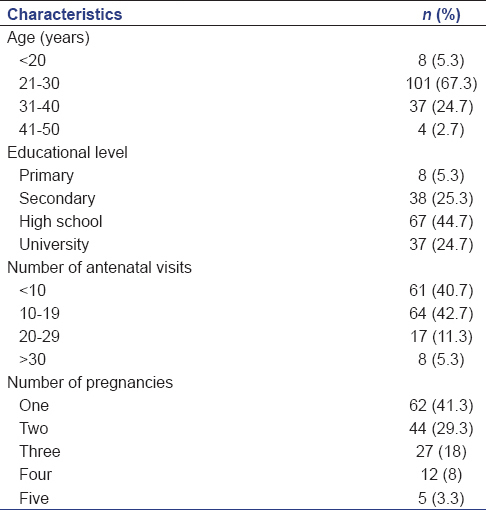 However, there were no significant relationships between the overall knowledge with the number of pregnancies (P = 0.183) and number of antenatal visits (P = 0.97). The study, which was done by Bello et al., they did not find a significant relationship between overall knowledge of the participants about congenital anomalies, with age and educational level. Their finding was inconsistent with the findings in our study. Furthermore, they did not find a significant relationship between parity and number of visits with general and specific knowledge of participants. These finding consistent our results. The participant who had High school and University education had the highest score in overall knowledge about the disorder. Furthermore, the age group 41-50 years had the lowest overall knowledge about the disorder. The participants aged 21-30 years, had the most knowledge of risk factors. Many of the participants (88%) were aware of the harmful effects of the use of unconventional drugs during pregnancy. Consumption of un-prescribed medications in the last few years has been repeatedly reminded to health centers and perhaps this is because of our sample's awareness. Majority (82%) were believed that consanguinity is a risk factor in congenital anomalies, while some (12%) believe that they were not. The results are in agreement with results from previous studies. They showed that an offspring with parental consanguinity had an increased risk for major birth defects. ,,, This is in contrast with the results from the studies by Zhang et al. and Karbasi et al. They did not find an association between consanguinity and congenital anomalies. , In accordance with the article of "Akrami," consanguineous marriage is common in our culture, accounting for more than 35% of marriages in Iran. Despite our Prophet's advice to avoid marrying close relatives, consanguineous marriage remains common resulting in child disability. Therefore, the genetic counseling before pregnancy can play an important role in prevention. History of congenital abnormalities shows increased risk. There is limited knowledge of genetics and its terminology among the general population. Some 18.7% of participants did not know the family history of congenital abnormalities as risk factors of congenital anomalies and about the same number remain unaware. Another study also indicated that familial inheritance and ethnicity were related to congenital anomalies. , Many of the participants, 140 (93.3%) indicated exposure to X-ray during pregnancy as a possible risk factor of congenital anomalies. It is important that women to be aware of risks associated with environmental hazards such as radiation. , Only 23.3% of the participants identified maternal obesity as a risk factor for congenital malformations and many, 45.4%, indicated they did not know anything about it. The prevalence of obesity in women of our country is 24.5%, which is a relatively high figure. Our participants had little knowledge about the relationship between obesity and pregnancy. With before pregnancy obesity, maternal, and neonatal morbidity increases. It is essential prior to pregnancy that women become educated in this matter. In this study, 55.3% indicated maternal infection as a risk factor and 38.7% of participants were unaware of this issue. Maternal infections are a proven risk factor. Certain infections, such as rubella, cytomegalovirus have shown to be high teratogenic. ,, Education and infection control in all women of childbearing age is the best way to prevent congenital anomalies. Only 43.3% of participants (<½) reported consumption of iodized salt during pregnancy reduces the incidence of malformations, and 38% were uninformed about it. Consumption of iodized salt prevents iodine deficiency in pregnant women. It can reduce the risk of infant mental retardation. Several sources identified that iodized salt reduces the incidence of congenital anomalies. , A significant fact, a very high number of the pregnant women, 93.3%, believed that regular checkups throughout the pregnancy period are effective in reducing the incidence of malformations. The results are in agreement with the results from the study of Bello et al. Most women who are at low risk for pregnancy complications will see their health care provider every month during pregnancy. Women with special health problems or a high-risk pregnancy may have many more visits to the healthcare provider. Regular checkups during pregnancy are very important factors in speedy diagnosis and treatment of complications. About 76.6% of participants of our sample knew the role of preconception counseling on reduction and prevention of congenital anomalies, and 18% did not know anything about it. The importance of prepregnancy counseling has recently been mentioned in various sources. , Knowledge of the etiology and pathogenesis of abnormal growth during antenatal, perinatal, and neonatal damages can rise. Today, the emphasis on the prevention of risk factors (primary prevention) has highlighted the role of prepregnancy counseling. During before pregnancy counseling personal and family history about different disease can be found, and the expecting mother can be trained to avoid risk factors. About 23.66% of the participants believed that unethical lifestyle is the cause of congenital anomalies. Integrity in our culture has a traditional root. Our people have always believed that unethical and illegal practices may ruin a person's life and can lead to congenital anomalies in newborns. Accordance to this study, participant had low scores on specific knowledge, but they had high scores on their knowledge of the risk factors and the prevention of congenital anomalies. Considering that most of the women in our study had only high school education, it may be difficult for them to understand congenital anomalies. Many thought that this knowledge is specific to physicians and health-care personnels. Nevertheless, their overall knowledge about congenital anomalies was at a moderate level. Therefore, the need for programs to increase awareness with a simple definition of congenital anomalies among the public in general and pregnant women in particular is imperative. Genetic counseling before pregnancy, even before marriage, is recommended for all women of childbearing age, especially for families at risk it is important to increase their knowledge of the disorder. Another point, with regard to consanguinity as a relatively common cultural practice among our people, public education about the importance of genetic counseling can be helpful and cost effective. Preconception counseling is provided in our women's health centers, but it does not include genetic counseling. Genetic counseling can be added to the counseling program before and during pregnancy. However, there is a need to train health personnel before full implementation. Because they are the future mothers, simple education and training program for high school girls to avoid risk factors and to practice preventions is recommended. Teaching public about behavioral risk factors can also be helpful. Dastgiri S, Kalankesh LR, Heidarzadehe M, Tajahmad A, Rezaian E. A new registry of congenital anomalies in Iran. J Registry Manag 2010;37:27-9. 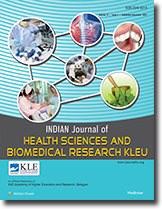 Dastgiri S, Imani S, Kalankesh L, Barzegar M, Heidarzadeh M. Congenital anomalies in Iran: A cross-sectional study on 1574 cases in the North-West of country. Child Care Health Dev 2007;33:257-61. Samadirad B, Khamnian Z, Hosseini MB, Dastgiri S. Congenital anomalies and termination of pregnancy in Iran. J Pregnancy 2012;2012:574513. Rasmussen SA, Erickson JD, Reef SE, Ross DS. Teratology: From science to birth defects prevention. Birth Defects Res A Clin Mol Teratol 2009;85:82-92. Mulholland C, Njoroge T, Mersereau P, Williams J. Comparison of guidelines available in the United States for diagnosis and management of diabetes before, during, and after pregnancy. J Womens Health (Larchmt) 2007;16:790-801. Corrigan N, Brazil DP, McAuliffe F. Fetal cardiac effects of maternal hyperglycemia during pregnancy. Birth Defects Res A Clin Mol Teratol 2009;85:523-30. Bello AI, Acquah AA, Quartey JN, Hughton A. 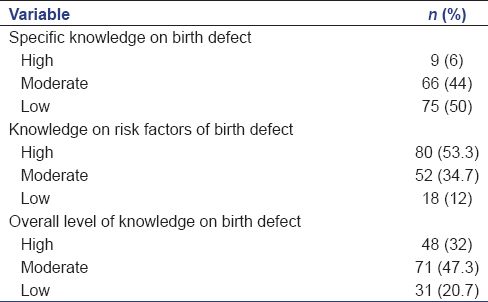 Knowledge of pregnant women about birth defects. BMC Pregnancy Childbirth 2013;13:45. Soleimani F, Teymouri R, Biglarian A. Predicting developmental disorder in infants using an artificial neural network. Acta Med Iran 2013;51:347-52. Fetal chromosomal disorders and neural tube defect screening guidelines. 2013. Available from: http://www.behdasht.gov.ir/uploads/Fetal_disord_screen_protocol_156115.pdf. [In Persian] [Last cited on 2015 May 17]. Abdi-Rad I, Khoshkalam M, Farrokh-Islamlou HR. The prevalence at birth of overt congenital anomalies in Urmia, Northwestern Iran. Arch Iran Med 2008;11:148-51. WHO|Congenital Anomalies. WHO. Available from: http://www.who.int/mediacentre/factsheets/fs370/en/. [Last cited on 2015 Feb 05]. WHO|Iran (Islamic Republic of). WHO; 2014. Available from: http://www.who.int/gho/countries/irn.pdf?ua=1. [Last cited on 2015 Feb 02]. Birth defects are common, costly, and critical: National Birth Defects Prevention Monthly. Available from: http://www.nbdpn.org/docs/2013BDPMPacket.pdf. [Last cited on 2015 May 17]. Executive Summary: March of Dimes Global Report on Birth Defects: The Hidden Toll of Dying and Disabled Children; 2006. Available from: http://www.marchofdimes.org/materials/global-report-on-birth-defects-the-hidden-toll-of-dying-and-disabled-children-executive-summary.pdf. Hackshaw A, Rodeck C, Boniface S. Maternal smoking in pregnancy and birth defects: A systematic review based on 173 687 malformed cases and 11.7 million controls. Hum Reprod Update 2011;17:589-604. Birth Defects: Sixty-Third World Health Assembly. 2010. Available from: http://apps.who.int/gb/ebwha/pdf_files/WHA63/A63_10-en.pdf. [Last cited on 2015 May 17]. National Birth Defects Prevention Network: NBDPN 2011-2015 Strategic Plan; 2013. Available from: http://www.nbdpn.org/docs/NBDPN_StrategicPlan2011-2015s.pdf. [Last retrieved on 2013 Aug 11]. Dahl K, Hvidman L, Jørgensen FS, Henriques C, Olesen F, Kjaergaard H, et al. First-trimester Down syndrome screening: Pregnant women′s knowledge. Ultrasound Obstet Gynecol 2011;38:145-51. Al-Jader LN, Parry-Langdon N, Smith RJ. Survey of attitudes of pregnant women towards Down syndrome screening. Prenat Diagn 2000;20:23-9. González-Andrade F, López-Pulles R. Congenital malformations in Ecuadorian children: Urgent need to create a National Registry of Birth Defects. Appl Clin Genet 2010;3:29-39. Reduce the Risk of Birth Defects. HealthyChildren.org. Available from: http://www.healthychildren.org/English/ages-stages/prenatal/Pages/Reduce-the-Risk-of-Birth-Defects.aspx. [Last cited on 2015 Feb 02]. National Birth Defects Prevention Network (NBDPN). Guidelines for Conducting Birth Defects Surveillance 2004. Available from: www.nbdpn.org/docs/NBDPN_Guidelines2008.pdf. [Last cited on 2015 May 17]. Meaney FJ, Miller LA, FASSNet Team. A comparison of fetal alcohol syndrome surveillance network and birth defects surveillance methodology in determining prevalence rates of fetal alcohol syndrome. Birth Defects Res A Clin Mol Teratol 2003;67:819-22. Honein MA, Paulozzi LJ, Watkins ML. Maternal smoking and birth defects: Validity of birth certificate data for effect estimation. Public Health Rep 2001;116:327-35. World Health Organization. WHO Report on the Global Tobacco Epidemic, 2011; Warning about the dangers of tobacco. Available from: http://whqlibdoc.who.int/publications/2011/9789240687813_eng.pdf?ua=1. [Last cited on 2015 May 17]. World Health Organization. Country Profile: Iran. Alcohol Consumption: Levels and Patterns 2010. Available from: http://www.who.int/substance_abuse/publications/global_alcohol_report/profiles/irn.pdf?ua=1. [Last cited on 2015 May 17]. De Vigan C, Vodovar V, Goujard J, Garel M, Vayssière C, Goffinet F. Mothers′ knowledge of screening for trisomy 21 in 1999: A survey in Paris maternity units. Eur J Obstet Gynecol Reprod Biol 2002;104:14-20. Soleimani F, Narenji F, Pourmohsen M, Khaleghinejad KH, Mehran N. Cerebral palsy and patterns of magnetic resonance imaging (MRI). a review. Iran Rehabil J 2014;12:59-64. Ornoy A. Neuro teratogens in man: An overview with special emphasis on the teratogenicity of antiepileptic drugs in pregnancy. Reprod Toxicol 2006;22:214-26. Tayebi N, Yazdani K, Naghshin N. The prevalence of congenital malformations and its correlation with consanguineous marriages. Oman Med J 2010;25:37-40. Harlap S, Kleinhaus K, Perrin MC, Calderon-Margalit R, Paltiel O, Deutsch L, et al. Consanguinity and birth defects in the Jerusalem perinatal study cohort. Hum Hered 2008;66:180-9. Zhang X, Li S, Wu S, Hao X, Guo S, Suzuki K, et al. Prevalence of birth defects and risk-factor analysis from a population-based survey in Inner Mongolia, China. BMC Pediatr 2012;12:125. Akhavan Karbasi S, Golestan M, Fallah R, Mirnaseri FS, Barkhordari K, Bafghee MS. Prevalence of Congenital Malformations in Yazd (Iran). Acta Med Iran 2009;47:149-53. Akrami SM. Consanguineous marriage; genetic counseling, culture and religious aspects. Iran J Pediatr 2006;16:359-65. Morice A, Ulloa-Gutierrez R, Avila-Agüero ML. Congenital rubella syndrome: Progress and future challenges. Expert Rev Vaccines 2009;8:323-31.